Moxibustion Workshop with Junji Mizutani — Amy Chitwood Burslem, LAc. This weekend I was fortunate to attend Junji Mizutani's workshop on applying moxibustion in clinical practice. 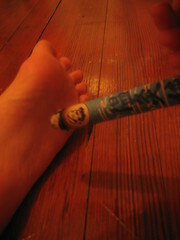 Moxibustion is a technique in which a cone of mugwort (Artemesia vulgaris), is placed on or over an acupoint or affected area of the body. The cone is then lit and burned, and is usually removed before burning the skin. It is used to stimulate and strengthen the qi, blood in the body. This seminar was organized through the Traditional Japanese Medicine Seminars of Portland (PDXTJM). As I am currently taking a Japanese Meridian Therapy (yet another wonderful form of acupuncture) class at OCOM with Bob Quinn, DAOM, I felt incredibly fortunate to be able to attend this workshop. "Junji Mizutani is the director of the North American Journal of Oriental Medicine (NAJOM). He is a leading authority on traditional approaches to moxibustion and has extensively researched and reported in the scientific literature. He graduated from the Japan Central Acupuncture College in 1983, and in 1984 he moved to Canada where he has taught shiatsu, acupuncture, and moxibustion for many years. He has produced a DVD on his moxibustion technique and has authored many articles published in NAJOM (North American Journal of Oriental Medicine). He also served three years as the president of the Shiatsu Therapy Association of Ontario. Currently he practices in Vancouver B.C. and lectures regularly at acupuncture schools throughout North America. I'll be writing more about this great seminar later in the week- stay tuned for more!